A technology that covers your eyes and shows you digital 3D images in a way that makes you feel like you're in a different place. Typically it involves a headset that looks like goggles, with one or two display screens positioned a couple of inches in front of your eyes, and lenses that make the images appear much farther away. The headset also tracks the movement of your head and syncs the images, so that you can look around in any direction in the virtual world you're seeing. What you see through a VR headset might be completely computer-generated (like a game), or it might be images (or video) of the real world, captured with a special camera. 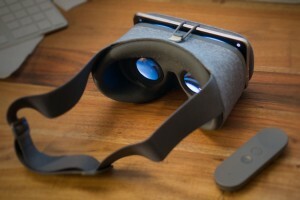 Basic VR solutions utilize a phone for most or all of the technology. The relatively cheap headset consists of lenses and little else. You can look around, but otherwise must remain stationary, and interactivity — if any —Â is limited. The most advanced VR headsets have their own displays built-in, must be connected to a powerful computer, and allow you to walk around in the virtual world and fully interact with it. There are many solutions that fall in-between these two extremes. Some phone-based solutions offer interactivity. Some do not require a phone, but have phone-like technology built into them so they do not require a separate computer. Different VR solutions offer varying levels of interactivity. The most basic interactivity is simply aiming, where you activate something by turning your head to look at it. There are also several types of hand-held controllers. The most advanced solutions can "see" and respond to your hands without needing to hold a controller. VR solutions vary wildly in lens quality, refresh rate, and resolution. Poor lenses can force your eyes to focus at an uncomfortable distance, and may introduce various type of poor image quality. A poor refresh rate will produce lag, which is disorienting and may cause the user to experience nausea. Poor resolution means that instead of sharp detail, you'll notice the pixels of the display, often as relatively large squares, which is called the "screen-door effect". The refresh rate and resolution are determined by the phone, if using a phone-based headset. Higher-end phones with faster processors and higher-resolution displays are best for VR. Differences in display resolution that may not be noticeable during normal phone use become very obvious when using a phone for VR.